At the BRICS summit over the weekend, the BRICS nations looked for ways to boost trade among their developing economies. Given the challenges each of them faces domestically, how will this bloc keep its allure? As the last member to be included in it, what is the role of South Africa? Global Times (GT) reporter Wang Wenwen talked to Professor Godfrey Netswera (Netswera), director of the South African BRICS Think Tank based in Johannesburg, over these issues. 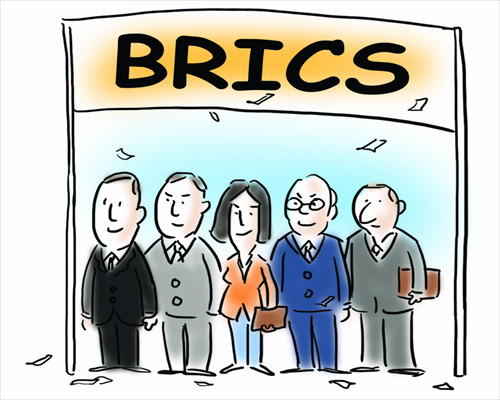 GT: Western observers say the promise of BRICS' rapid and sustainable growth has been challenged in the past few years. What do you think? Netswera: The skepticism from the West is anticipated. We are not surprised. We expect that the West will have a very negative attitude toward this development. The BRICS is a group representing historically marginalized societies - the so-called Third World or the Global South. When they think there is no momentum as far as development is concerned within the BRICS group, I think this is a fairly subjective statement. The group has been able to achieve something which other multilateral organizations established in the past have not been able to do and that is the establishment of the BRICS New Development Bank (NDB). Institutionalization within the BRICS group is a very important priority. We spoke about the bank and now it is a reality. We are now speaking about the establishment of a research institute and it is going to become a reality in the coming years. Then we will be able to get data and depend less on datasets generated by the World Bank, the UN and to a large degree the OECD. We spoke at the BRICS academic forum, held in Goa between September 19 and 22, about the establishment of a BRICS rating agency and that was affirmed by the BRICS heads of states this past Sunday. So if you look at all these developments, you'll see that if all these propositions get implemented in the coming few years, BRICS will have a lot of institutions that will help the grouping perform its tasks better. GT: What are the challenges for the development of BRICS? Netswera: There are limitations obviously. Some are brought about by a lack of finances. There are a lot of competing priorities. First and foremost, each of the BRICS nations is interested in making sure that it utilizes resources for its own national interest before it thinks about BRICS. There are also limitations of skills and capacity which may hinder the implementation of the BRICS agenda. GT: There were many doubts surrounding how South Africa fits in the BRICS bloc. How do you see its inclusion? Netswera: A lot of people who discount the role of South Africa are generally looking at the economic contribution toward the BRICS bloc. I don't think this is the original argument for formulating the BRICS grouping. The economy is important, but it is not the only consideration. When the BRICS grouping came together, there was unhappiness with the functionality of other multilateral forums like the UN and the World Bank and specifically how the South has historically been treated. They wanted to make sure that there are positive reforms in these multilateral forums. We do not want to replace the World Bank or the IMF. It is fairness in treatment within multilateral forums. It is also a question of economic dominance given the rise of China and India. There is optimism that countries from the South can have the power to force change at international multilateral forums. South Africa plays a very strategic role in BRICS. It represents the African region. When the BRICS nations speak, they do not speak only for themselves. They speak for the region in which they belong. South Africa has good elemental of legitimacy within the African Union and within the continent to represent the region. The inclusion of South Africa into BRICS will definitely raise Africa's voice in the world. If you look at the loan terms that come from the NDB, other countries in the region will be able to borrow with surety from the member country of that particular region. Let's assume a country like Kenya or Zimbabwe wants to borrow from the NDB, it means that it has to raise proposals to South Africa. This will advance the general ideology behind development for the small nations. South Africa itself is going to benefit. The loans that the member countries will get from the NDB are interest free. That by itself is a very positive development. GT: Some argue that BRICS was a geopolitical formation counteracting Western hegemony when it was established. How do you view it? Netswera: We discourage the use of the terminologies like "counter." It suggests that we are unhappy with everything happening at multilateral forum and we want to start our parallel and separate club and do our own things. That is not the position. We do not want an alternative. We want to sit on the same table with everybody and be treated like everybody else. We do not want somebody dictating terms for sitting on this table. It is not counter Western hegemony. It is global hegemony - it is necessary influence for positive results. We want to have influence on what happens in the World Bank and IMF and make sure that the voices that were historically marginalized are going to be heard including in the Security Council.